Overdoses have lowered the life expectancy in the United States for two years in a row. The leading cause -- opioids. This epidemic has spread through every sector of our country, destroying lives as parents, friends, families, and those entrapped by opioids struggle to find help. The opioids epidemic is dire, but there are answers -- and recovery is real. 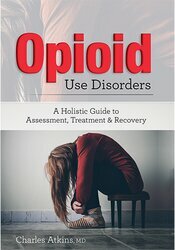 Dr. Charles Atkins, well-known opioids addiction expert, brings together current research, emerging therapies, and non-drug and integrative strategies in a practical guide for both professionals and the public. Charles Atkins, MD, is a board-certified psychiatrist, clinical trainer, Chief Medical Officer of Community Mental Health Affiliates (CMHA), member of the Yale volunteer faculty, and a past regional medical director for the Department of Mental Health and Addiction Services (CT). A frequent lecturer on opioid addiction and Medication Assisted Treatment, Dr. Atkins is the author of Co-Occurring Disorders: Integrated Assessment and Treatment of Substance Use and Mental Disorders, which has been included in the core curriculum of multiple schools of social work and substance abuse counseling. He is also the author of more than 15 other traditionally published books, both fiction and nonfiction, and has had hundreds of short stories and articles appear in publications ranging from The Journal of the American Medical Association (JAMA) to Writer’s Digest Magazine.